One of the Best Locations at Big White! 'The Powder Den' is close to all the action and excitement of Town Centre and Happy Valley but in a quiet area of exclusive homes. 'The Crescent' is a 10 unit luxury boutique condo building situated in White Forest Estates. The Happy Valley lighted ski trail is right outside the backdoor and leads directly to Town Centre or to Happy Valley where you will find the Gondola, Outdoor skating rink, Ice Climbing Tower, Tubing, Horse Drawn Sleigh Rides, Kids snow mobiling, Snow Shoeing and Tours. In our Guests own words (see our reviews) The Powder Den is ideal for romantic get-away, Girl's get-away, Tourist's without a car, 55+, adventure seeker's and families with teens or young children. Our unit is tastefully decorated with leather furniture, original artwork, vintage ski posters and of course a decorated Christmas Tree. The kitchen is stocked with basic cooking supplies and everything you need for gourmet cooking. The 9' ceilings give an airy feeling and the entry and bathroom floors are heated slate. All counters are granite, Stainless Steel Appliances and high end fixtures. The private hot tub and private steam shower are a real treat after a hard days skiing and you'll drift off to sleep in the beautiful beds topped with feather beds and down duvets and be ready for the next days activities! Our Guest's have mentioned how much they appreciate having robes to use especially for the hot tub. This was a must have for us when we were outfitting The Powder Den because our experience was that very few ski rental's supplied them and they are one of the things you don't want to pack because of the bulk. We have tried to think of everything that would ensure that our guest's have the best ski vacation ever! My husband and I retired from the Real Estate profession this year now we have time to enjoy the things that we love...Our Standard Poodle Liza, kayaking, cycling, hiking and learning all about our new Sailboat! We bought this property because of the true ski-in/ski-out and that it was a small (only 10 units) upscale condo in an area close to town centre yet not right in town centre. We can walk to town centre for shopping etc. but are not disturbed by the rowdyness of being right in TC. Of course the most important is that we are truly ski-in/ski-out! Master bedroom has a 4 pce. ensuite, granite counters and heated floors. Main bathroom is 4 pce. with steam shower, granite counters and heated floors. Family oriented ski resort with everything you need to enjoy your ski vacation such as shopping, restaurants, complimentary snow hosts and much more. Even tho' you are sitting on the mountain of Big White there are lovely views of the Monashee's mountains from the Powder Den. Best Location on the Mountain! True Ski-In and Ski-Out! Minutes to all the excitement of Town Centre and Happy Valley yet in a quiet area of upscale homes. Heated, secure underground parking for 1 car and arrangements can be made for a 2nd. vehicle. With Queen sofa bed. Seats 6 guests. Flour, sugar, salt, pepper, coffee, tea, baking powder, baking soda, spices etc. Double sets of just about everything! Crock Pot, blender, salad spinner, sharp knives, knife sharpener and much more! Fully equiped with many extra's and basic cooking supplies. Dining room is close to kitchen and seats 6 comfortably. (3) Large, flat screen, LCD in living room and smaller flat screen, LCD's in each of the bedrooms. New! PVR (Personal Video Recorder) so you can record your favorite shows while out on the slopes! Lots of paper books and magazines for your enjoyment. Take a book or leave a book! with private hot tub and BBQ. It was a great location for both skiing and walking to the main village. The place is very nice with a lot of amenities. I would definitely stay here again. Thank you! We are so happy that you enjoyed the Powder Den and want to thank you for being a 5 star guest and we would love to have you back again! Cute, comfortable, clean, affordable, well equipped, great location. comfortable beds, great linens. Ski in/out access awesome. Great place to stay. Thank you for the lovely review! It is definitely our home away from home when we are on the mountain too. We are extremely grateful to have guests like you staying in our winter home and taking such great care of it and we would love to have you come back! We thoroughly enjoyed out stay, accommodation was just as described, great location and had all the amenities we needed. Thank You! We appreciate your feedback and appreciate having great guests like you staying in our winter home The Powder Den! Absolutely lovely place, warm and close to village! We enjoyed our time here very much. The place was tidy, well equipped and very comfortable. Loved the flannel sheets and the hot tub! Great place, great stay, great snow! Thank you Loreen! So I can say "Great place, Great Guests!, Great Snow"
We hope you come back! Nice condo in a quiet building with everything we needed. Easy access to the village via Happy Valley trail. Loved watching the fireworks from the hot tub! Thanks, Cheryl and Doug for sharing your winter home with us! Michelle and family.....Thank You for taking such good care of our winter home! WE LOVE having wonderful guests like you staying in the Den! Discover a true Canadian experience at Big White Ski Resort. Mild sunny climate, dry, fluffy powder and endless activities for the entire family. Awarded with 'The best place to go for quality snow' by Conde Nast Traveler Magazine. Progressive terrain offers 118 runs, 16 lifts (6 hi-speed), Telus Terrain Park (rated as the best progressive park in North America and 25 km. of incredible Nordic Trails, groomed with state-of-the-art equipment for both skate and classic technique. 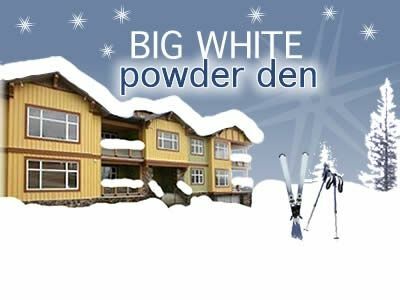 Big White is also BC's premier family destination~outdoor skating, tubing, mega coasters, ice tower (60 feet), snow mobiles, snow shoeing, dog sledding or snuggled under blankets on a horse drawn sleigh ride, climbing wall, kids movie nights, Wii Nights, Bingo Night and Skating parties. So much to choose from. After the days activites there are many restaurants, pubs or coffee shops to choose and fine shopping. The Visitors Guide offers detailed information and you will find one in the Powder Den. Rates based on 2 people. $25 extra per person per night for up to 6 guests in total.